Do you want to try tasty potatoes?! 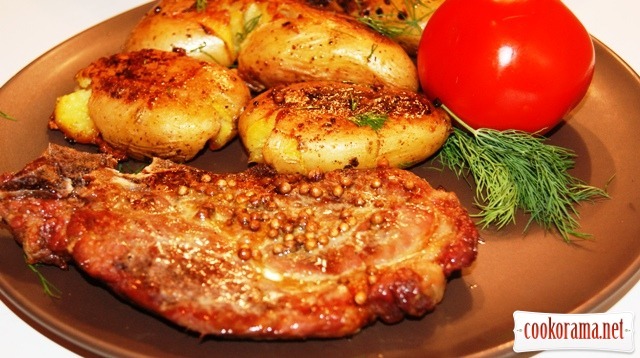 Then read this simple, but great recipe and cook immedeately! Here, what wrote about this, my frendessa Venera and I agree with her on all 100%!!! Pommes de terre fondantes (melting potatoes) – ancient French recipe. The idea of this recipe: potatoes are boiled in broth till readiness, then press a little till crack – and opened potato soak broth inside, which makes potato saturated and soft to taste – «melting» by texture. After evaporating of liquid, continue to fry potatoe till golden crisp. 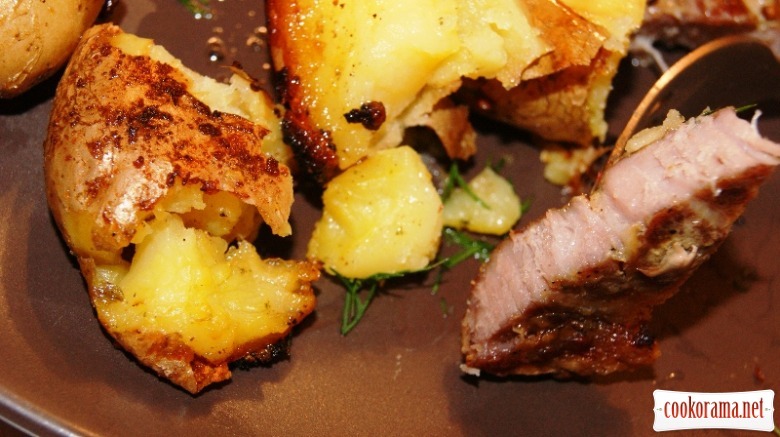 To taste it remained baked mith meat potatoes, but this one takes much less time. 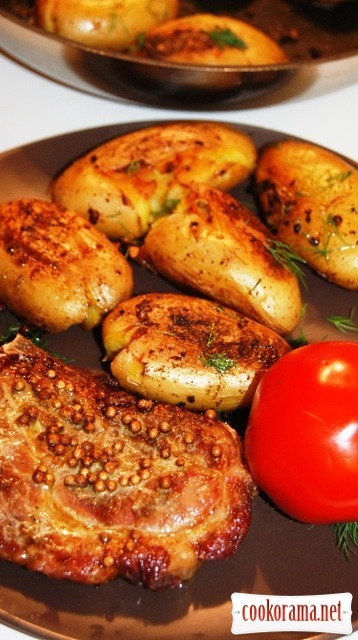 This potatoe is good to serve with any baked meat or just with fresh green salad. Wash potatoes well and put in a Teflon frying pan (or cast iron) of 25 сm (ther might be some space between potatoes). Add broth (should cover potatoes a 3/4), a sprig of rosemary (coriander and pink pepper), olive oil, butter and salt. Wait till boiling. Reduce heat to the average abd slightly cover the pan with a lid. Cook for 15-20 min till readiness of the potatoes (remained broth shoul cover potatoes almost in half). Return pan on the average heat and continue to cook with out lid till evoparating of liquid, for 10-15 min, potatoes should fry a little. Carefully turn potatoes and fry from the other side for 4-5 min. 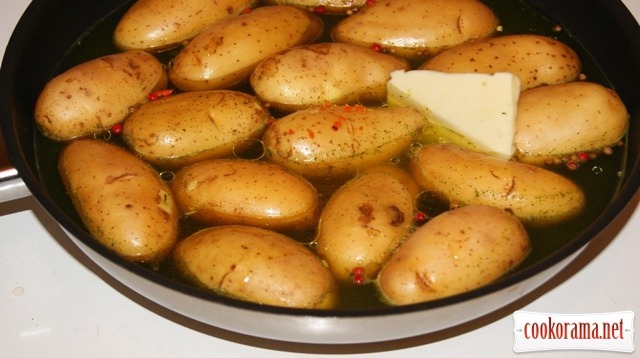 Remove pan from the heat and leave potatoes in it for 5 min. Serve it hot, sprinkle with green onion (dill). 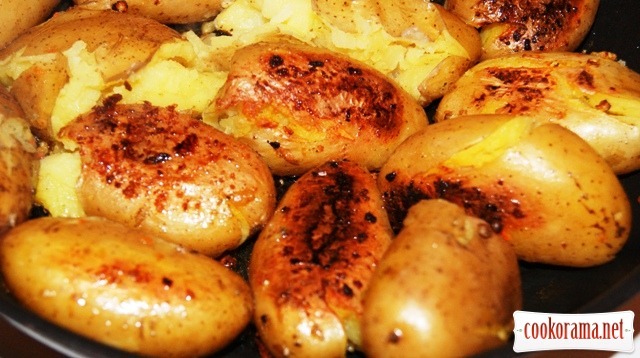 Top of recipe ""Baked" potatoes (Pommes de terre fondantes)"